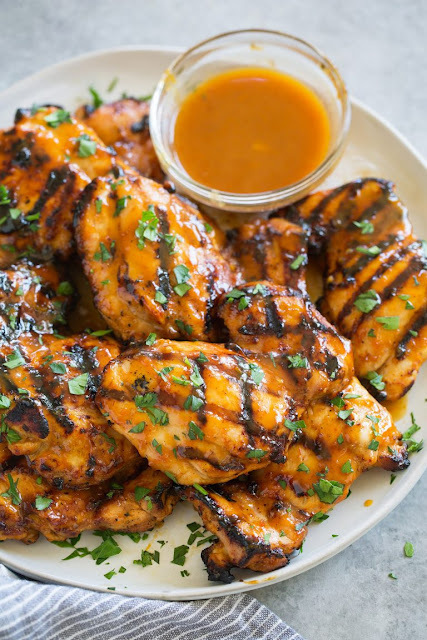 This Sticky Honey Orange Grilled Chicken has such a bright and delicious blend of sweet, tangy and smokey flavors. Its so easy to make and that glaze will leave everyone craving more! My whole family loved this chicken! A delicious take on orange chicken! Such a bright and delicious blend of sweet, tangy and smokey flavors. Its so easy to make and that glaze will leave everyone craving more. My whole family loved this chicken! In a medium mixing bowl whisk together orange juice, orange zest, lemon juice, olive oil, hot sauce, dijon mustard and garlic. Place chicken thighs in a gallon size resealable bag, pour marinade over chicken then seal bag while pressing out excess air. Rub marinade over chicken, transfer to refrigerator and let marinate 1 - 6 hours. While grill is preheating prepare glaze - in a small saucepan melt butter over medium heat. Whisk in honey, orange juice, orange zest, BBQ sauce and dijon mustard and remove from heat. Set aside about 1/3 cup for serving. Grill chicken about 4 minutes per side then brush with glaze and grill until cooked through (165 degrees in center) and slightly charred about 2 minutes per side more. Serve warm with reserved glaze, garnished with parsley if desired. 0 Response to "Sticky Honey Orange Grilled Chicken"